I don't really eat very many of these since, well, they'll pack the weight on you like nobody's business. On the other hand, they are SO GOOD!!!! I've prepared them in the past for my kids and always called them Grandpa's World Famous Non Toxic Deep-Fried Sandwich. 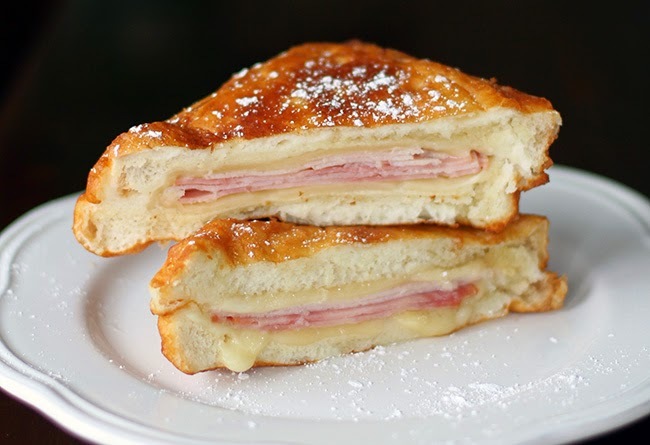 So, call it a Monte Cristo, Grandpa's Non Toxic, or just Coronary On A Plate, it's worth it. 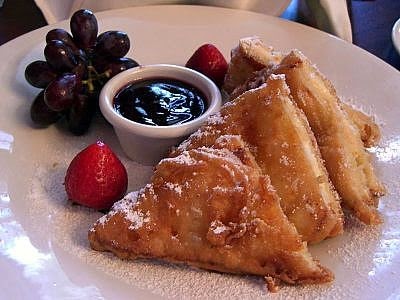 I've eaten Monte Cristo's in restaurants, bistros, saloons, and taverns all over the country, but the best ones are served at the Blue Bayou in Disneyland. And this recipe will remind you of it (if you've ever eaten it there), or it'll give you a hint of the delight that awaits you (if you haven't). Some cooks prefer to heat the oil to 400 degrees F. In my particular case, I use a cast iron skillet on an electric range cooktop, so I just heat the oil until it's hot. Frankly, it's hard to make much of a mistake here. Regarding the bread, I prefer thin sliced “sandwich” style white bread—the sort that's baked square rather than rounded on the top. It makes a nicer looking sandwich. Finally, make sure to serve it with some sort of fruit jam or preserves. My favorite to accompany this sandwich is Black Current Preserves. There is no part of this sandwich that's low-fat, low-calorie, gluten-free, high-fiber, organic, or in any way friendly to the environment, but Lord is it tasty.